Technology courses are essential to every Catholic school curriculum. In fact, technology is required to be integrated throughout each course of study from Mathematics to Religion. The use of technology in the 21st century is integral to preparing students for college and career success. Technology courses in Catholic schools cover a variety of lessons including Research and Information Fluency, Digital Citizenship, Creativity and Innovation, Communication and Collaboration. All of these units are taught and influenced by the lens of Catholic identity and the dignity of all humankind. At St. Michael - St. Clement School, students participate in technology classes from Pre-K3 to grade 8. Thanks to a $125K grant from the Knott Foundation, students now have 1:1 access to either an iPad or a Dell Chromebook in the classroom. iPads are allocated to all students in Pre-K 3 through Grade 2, while students in Grades 3-8 receive Dell Chromebooks. Students carry the laptops with them throughout their school day. iPads and Chromebooks are kept at school. However, student can access content at home by using their google email account. Code-a-pillar Strengthens coordination and fine motor skills. There are 9 easy-to-connect segments that preschoolers can arrange and rearrange to “tell” the toy how to move: forward, left, right, wiggle, dance or even wait for a couple seconds before moving again. Students learn about basic sequencing through play. Ready…set…code! Encourages experimentation while developing problem-solving skills, planning, sequencing, and critical thinking. Sphero Mini bots Develops problem solving skills, mathematical thinking, focusing, and attention to detail. Introduces ideas of symmetry, balance, as shapes and sizes are explored. 5th - 8th Grade Extensive coding, 3-D modeling, exposure to robotics and drones Explores different learning pathways, turns frustrations into creativity and innovation, builds engagement and creates excitement while allowing students to conceptualize and visualize designs through all stages of development - from sketch to final product. STM-STC also utilizes digital textbooks and/or online streaming opportunities. Students in grades 4-8 utilize e-books for Science and Social Studies, while students up to Grade 3 will stream content and instructional resources which deepens student engagement and extends critical thinking! Also, as a result of the recent $1.2M in school renovations, Labouré Hall is now equipped with a Hydroponic Garden Station which is a self-contained growing system which consists of a growing container, a water reservoir, growing media, and a pump that recirculates the water. We recently planted lettuce and spinach seeds and sprouts should be seen in time for our Winter Open House. 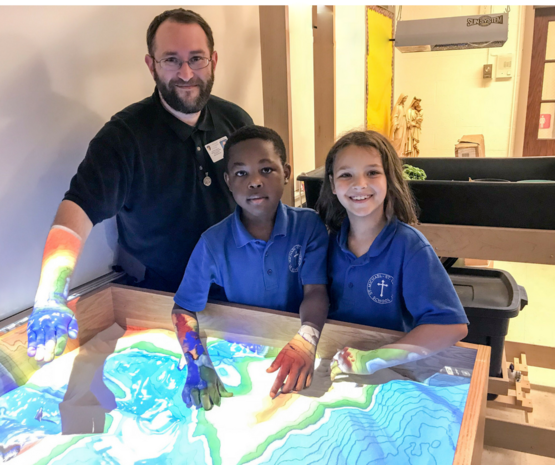 Another hands-on STEM application at STM-STC is our Augmented Reality Sandbox which allows students to create topography models by shaping real sand, which is the augmented in real time by an elevation color map, topographic contour line and simulated water. The system teaches geographic, geologic, and hydro-logic concepts such as how to read a topography map, the meaning of contour lines, watershed, catchment areas, levees and more. 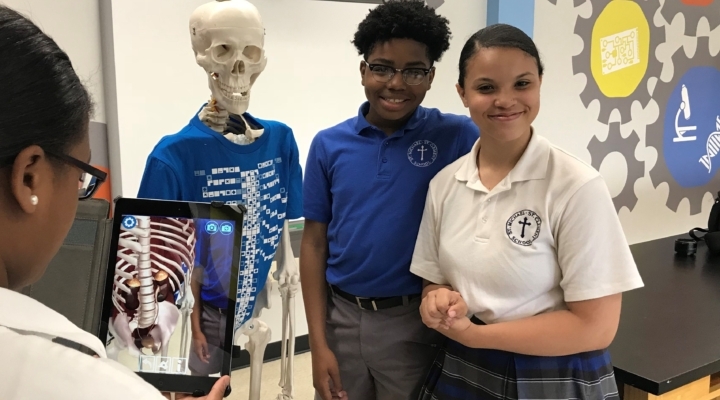 In addition to the core technology integrated curriculum, 3D printing has been added as an activity to enhance instruction throughout many of the schools in the Archdiocese of Baltimore. On May 5, 2015, Archbishop William E. Lori held a press conference to announce an exciting new initiative that makes a 3D printer available in every Archdiocesan school. The initiative was made possible due to support from the Embracing Our Mission ~ Shaping Our Future capital campaign, a generous donation by Mr. & Mrs. Joseph Croteau, and our technology and curriculum partners, 3D Systems and STEAMTrax. 3D printing is considered a “game-changer” for schools, as they provide children with unparalleled access to innovative technology used by engineers, astronauts on the International Space Station, and medical professionals and scientists. St. Michael - St.Clement School students have access to this same technology and a curriculum that allows our students to become more ready every day for future discoveries and advances we have yet envisioned.